The Nikon TMS is a compact high-performance inverted microscope with powerful illumination halogen lamp provides enough brightness for phase contrast and NAMC observation. 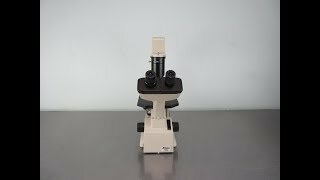 The Nikon TMS inverted microscope is easy to operate and simple to maintain. This lab microscopes optical system is used for providing flat, sharp and clear images, while achieving longer working distances and higher numerical apertures. The Nikon TMS inverted microscope stage features a low-profile design making it the ideal size for a lab bench of bio safety hood. The Nikon TMS Inverted Microscope is widely used in many labs and a great and simple choice for an inverted microscope. It is often used in tissue culture laboratories around the world and is used to produce high quality images to meet the microscope needs of biological and metallurgical research. The Nikon TMS Inverted Microscope is the successor to the Diaphot TMD. The Nikon TMS contains a triple base to hold various objectives. The lens used belong to the Nikon's CF series. The focus can be easily adjusted through the Nikon TMS's built in knob and the ability to adjust the light level on the built in 20W halogen lamp. You can add a variety of accessories to the Nikon TMS microscope, such as stage extenders, extra-long working condensers, phase slider and rings, and you can even switch out various stage adapters. Dimensions 17" x 8" x 18"
This Nikon TMS Inverted Microscope is in great condition and backed with our standard warranty. If you have any questions about this used lab equipment listing please feel free to contact us.